This Grymoire is like opening a grimoire. Throughout my gaming career, two entities have remained exciting and fun in each iteration: Pokémon and Final Fantasy. These two games, other than following jRPG conventions, follow two very different themes and styles of gameplay, so never in a million years did I think that there could be a successful blend of the two that didn’t feel hackneyed and cliched. World of Final Fantasy has proven me wrong, though, and Square Enix’s latest spinoff from the main Final Fantasy series is a triumph in setting new ground for the franchise. World of Final Fantasy is a story about a young, amnesiac brother and sister, Lann and Reynn, who find themselves in the position that they must save the world of Grymoire. They must do so using their ability to capture and train Mirages, which take the form of various summons and monsters of the Final Fantasy world. This is where the Pokémon-style gameplay comes in. You can capture almost all of the Mirages you meet, and by leveling them in battle you can teach them new abilities and, after meeting certain requirements, transform them into stronger forms. Grymoire is filled with characters, locations, items, and creatures from all across the Final Fantasy universe, but they’re not linked to their stories from the various entries to which they belong. That means when you meet the Warrior of Light, Cloud Strife, Terra Cole, or any of the other numerous cross-over characters, you shouldn’t expect them to reference the games they’re from. Even though almost all the game’s content is crossed over, in the games canon it’s always been a part of Grymoire. 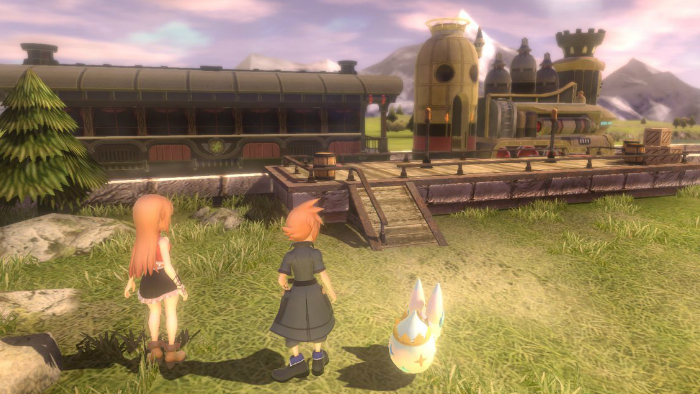 Unlike the recent entries of the main series of Final Fantasy, World of Final Fantasy features a much brighter world. Grymoire is filled with chibi versions of Final Fantasy characters and monsters called Lillikin, which gives it a much cheerier and retro style of visuals. Even though the visuals have the chibi style, the PlayStation 4 version doesn’t skimp on HDR and bloom, and even though everyone is pint-sized, they still look great. Lann and Reynn can change between both a Lillikin form, and a form that makes them look like regular-sized people called the Jiant form. 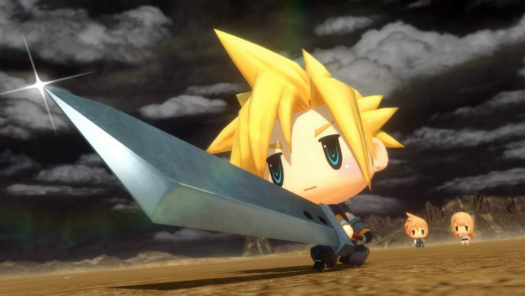 The majority of the entities you’ll meet in World of Final Fantasy will be adorable super-deformed versions of themselves, with only the head members of the antagonistic Bahamut Army being Jiant-sized. To capture Mirages, you’ll need to figure out what conditions must be met to allow their capture. The Mirages early in the game simply require you to damage them enough and you’ll be about to catch them for your own use. However, later in the game, you’ll have to fulfill more specialized conditions, like healing a monster multiple times or inflicting certain status effect before you’ll trigger the ability to recruit a Mirage. This actually makes capturing Mirages much more challenging and interesting than the Pokémon series and serves to add differentiation to the capture system of World of Final Fantasy instead of being a direct copy. The combat of World of Final Fantasy is a lot more complicated than Pokémon, in fact for a game that seems to be meant to appeal to younger gamers, it’s downright inaccessible.The centers around utilizing stacks of various sized Mirages which you've captured to combine their powers into a singular combat unit. The base of your combat party is Lann and Reynn, who can change between their Lilikin, or chibi-like, forms, and Jiant normal sized forms, and fit into the stack at either the base or the center. You then can choose two other Mirages to fill out the rest of the stack. Each Mirage has powers inherent to itself, so choosing a Mu for your stack might give you Blizzard, adding another Mirage that knows Blizzard would cause those two powers to stack and in-battle you’d be able to use Blizzara as a result. In combat, World of Final Fantasy utilizes the Active Time Battle (ATB) system that many jRPG fans are accustomed to. Basically, the enemies on the battlefield take turns executing actions, at which point they must wait a certain period of time to take another action. Each stack you create directly impacts your actions in battle, so for each new area you enter you’ll have to gauge the enemy’s strengths and weaknesses to make sure you’re utilizing your resources to their fullest. You can also choose to fight unstacked, which allows each of your Mirages and Reynn and Lann to have individual turns. This allows you to attack more often and limits the amount of damage the enemy can do by making them split their attacks between more targets. However, each of your fighters unstacked are much less powerful and can do much less damage on their own. There’s also plenty to do in World of Final Fantasy besides just nostalgiaing out. There're side quests galore, many dealing with the various crossover characters you’ll find, and be able to summon to fight with you, as the game progresses. You’ll also want to hunt for rare and powerful monsters, and see just what forms your Mirages will transform into as they become stronger. Unfortunately, the game can be a bit challenging from time to time, and you may find yourself having to grind because you need a certain Mirage’s powers to conquer a boss, or you might just find yourself underpowered from time to time. As the 30th anniversary of Final Fantasy approaches, there’s no better way to celebrate the adventures that we’ve treasured than World of Final Fantasy. Even though the game is a huge crossover event, by making everything make sense in its own world of Grymoire, the game doesn’t rely exclusively on nostalgia to hook players. Even though you’ll see Sephiroth, Squall, and other friends in your quest, even those who somehow don’t know these iconic characters can get enjoyment out of the great gameplay and light-hearted story of World of Final Fantasy.